The house, built in 1845, features 5 reception rooms, 7 bedrooms with 5 en-suites spread over 6,500sqft. It comfortably sleeps 16 people in 1 Eastern super king (2mx2m), 4 super kings (2mx1.8m), 4 doubles (1.4mx1.8m) and 2 singles (1mx1.8m). The property is heated from the environmentally friendly wood pellet biomass heating ensuring a warm stay whatever the time of year. This is further supplemented by 3 log burners to really set the mood on a wintry night. 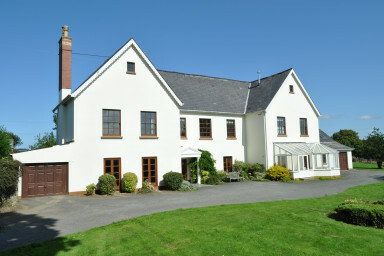 The house is situated with 14 acres of private land with secure access via electric gates. Within the grounds is an indoor swimming pool and hot-tub, and large natural lake featuring stunning vegetation, 200 fish and a boat house. The house is dog friendly, and you are welcome to bring them at £25 for the first dog and £15 per dog for each additional dog.